A newly published “novel” titled “The Circumcision of Adam and Eve” (2016, Harp Bookz International) by young writer/publisher Tatenda Charles Munyuki is an experimental deviation from commonly accepted values both in its form and content.It stylishly excludes some elements of fiction such as dialogue, conflict, etc. Titles like Munyuki’s book are likely to attract different reactions from different people but he is not the first writer to use a title that, in Christian belief, seems to reduce highly placed spiritual entities to ordinary human figures. Renowned Zimbabwean author Stanley Nyamfukudza had his short story collection titled “If God Was a Woman” (1999), although different were the themes he went on to tackle in the anthology. Munyuki’s title no doubt brings to the mind the established story of human creation, of Adam and Eve, as told in the Old Testament. 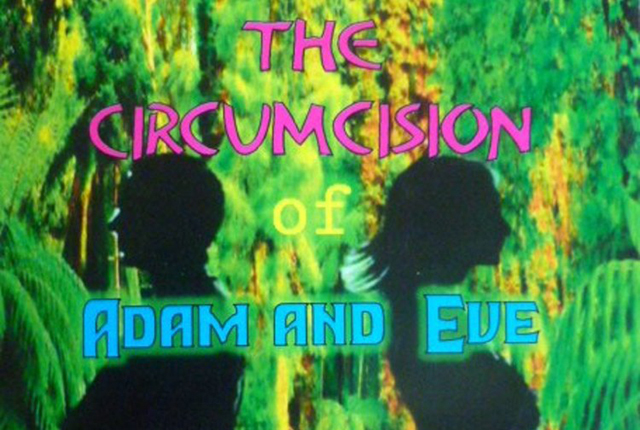 Although we know of Adam and Eve as the first man and first woman respectively, not much has been recorded about their circumcision — a subject Munyuki explores in a satirical way as, after reading the book, the author’s intention to portray life on earth as a travesty of life in Eden become clear. In the Bible, Adam was husband of Eve and the progenitor of the human race. In Munyuki’s book, Adam is in no way related to the other character Eve. In the Bible, Adam and Eve disobeyed God when they ate the forbidden fruit from the tree of knowledge of good and evil and they were driven from their paradise. This is known as “the fall of man”. Munyuki’s novel begins from this moment of “the fall of man” — now Adam and Eve are ordinary human beings unknown to each other, and living on same planet earth. They are the two main narrators/characters in Munyuki’s book. Their language is slangy, sarcastic but also humorous. The narrators love the four-letter words which make one wonder which type of audience Munyuki writes for! The two narrators, Adam and Eve, tell the reader their separate fictional biographies in dramatised and alternating monologues under the seven topics titled “Birth to Becoming a Youngster”(1-11 years), “Into a Teenager, The Young Adult” (12-21 years), “Discovering and Vulnerability, the Omens” (22-31 years), “The Adult” (32-41 years), “The Middle of Being Human” (42-51 years), “Into the Elderly” (52- 61 years), “Bonus Years, The Sum of All Fears” (62-77 years). The author explores parallel biographies in a single book and what we have here are two same aged characters with different attitudes to life, existing separately, their lives never meeting until at the very end of the book when they are old and in a foreign country. Even when they meet, they remain strangers! Under each given topic with a given guiding age tag, Adam and Eve take turns to speak about their life experiences. They talk about the psychological and bodily changes they undergo, and their views on these changes. It’s like the author is comparing and contrasting their lives, listening in to their opinions about issues such as gender, childhood, youth, education, relationship, employment, parenthood, success and failure, ageing, etc. It is from their alternating monologues that one gets to understand their chronological biographies. For instance, Adam is born, tells us he went to boarding school, married and divorced, re-married, had family, became successful and but also a corrupt boss, left the country to evade being arrested and settled in a foreign unnamed country. Eve, who calls herself ‘daughter of a prostitute’, stays with her Granny, goes to school but realises she is not academically gifted. She is impregnated when she is still very young but she fights through all odds as a single mother to become a popular and wealthy gender activist. In her old age, she takes traveling as a hobby and this is when she travels to a country which Adam has adopted as “second home”. In this country, old Adam has a bench he likes to usually sit on while watching kids play around in a certain park. Eve, one day, exhausted from whatever she has been doing, comes to the park to take a rest on the same bench where Adam is sitting. Reader expectation is high at this climactic moment when the two strangers meet but nothing happens except Adam telling us: “I look at my side. It’s a woman . . . She looks at me. She looks like someone I could have known in a past life. We don’t look so different in age . . . She smiles and looks away toward the horizon . . .
Munyuki was born in 1986 in Harare. He is also into film-making and helping local charitable organizations using his female based books to gather aid for them. According to the author, he has published more than seventy books so far. Surely, his book empire deserves an article on its own, for how could Zimbabwe not know its own author of those many books!